﻿ The End of the World? Since the beginning of human history, speculation about the end of the world has fascinated mankind. Myths and stories about the end of the earth exist in almost every religion and culture ever known. And yet, somehow, men seem unsatisfied with the answers they receive. They turn to Nostradamus, Edgar Cayce, or ancient Hindu writings hoping to uncover some modicum of truth that will satisfy their innate desire to know something about the future and the ultimate fate of the world. Never has mankind's fascination with the end been more prevalent than it is today. Fears of global warming saturate the news media. Worry over a nuclear holocaust persists into its sixth decade. And storylines of asteroids, comets, aliens, or bio-engineered super-diseases wiping out all planetary life continue to dominate the themes of many Hollywood blockbusters. Throughout the world, people are plagued with the same recurring questions. Will the human race become extinct? Will nuclear war or global warming destroy the biosphere? Will the world as we know it continue to exist? 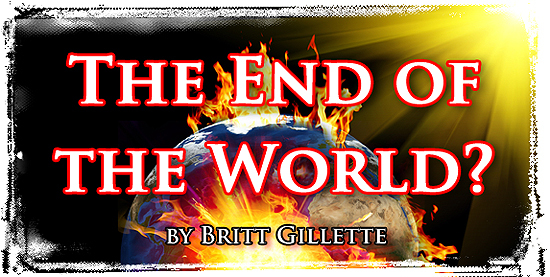 The answer to these questions and many others concerning the end of the world are not found in the writings of Nostradamus, Edgar Cayce, or any other self-professed psychic. They can't be found in Islamic, Hindu, or Buddhist writings. However, they can be found in the Bible. The bible, which has a track record of 100% accuracy when it comes to future events, has much to say about the ultimate fate of the earth, the people who live here, and creation itself. For those who wish to know the answers to these age old questions, the bible is your definitive source. According to the bible, the earth is eternal. So despite what some people say, we shouldn't worry about the earth itself being destroyed. However, throughout the ages, the nature of the earth has changed, and it will change again in the near future. The Book of Genesis teaches that God created the earth and everything in it to be perfect. However, the nature of the earth changed when Adam and Eve partook of the forbidden fruit in the Garden of Eden. This act prompted God to place a curse on the earth, and it radically transformed the nature of the earth itself. Several centuries later, the human race had become so corrupt that God decided to destroy it with a flood. However, God spared Noah and his family, allowing them to repopulate the earth of the present day. Throughout these changes, the earth as a creation has remained intact. But its nature has been radically altered twice. The bible teaches that it will soon be altered third time, and this time, the result will be far different from the previous ages. From these passages, it is clear that God will one day use fire to create a new earth from the present world. It will be dramatically different from the one in which we live. But how different? What will the new earth look like? The bible provides us with a vivid illustration. What Will the Future Earth Look Like? God will finally lift the curse He placed on the earth following the fall of man in the Garden of Eden. This curse created a conflict between the animal kingdom and mankind with many humans killing animals and many animals killing humans. But on the new earth, "nothing will hurt or destroy." And the number of people who know the Lord will be as endless as the waters in the sea. Babies will not die, and the lifespan of the human race will be extended well beyond current expectations. Life expectancy will be so great that the death of a one hundred year old person will be a notable tragedy. People will enjoy the fruits of their labor without fear that someone will come and steal what they have. The people of the new earth will be so close to God that He will answer their prayers before they have even prayed them! Animals who are natural enemies in our age will become friends on the new earth, and all the animals of the earth will be herbivores. The first part of this passage was partially fulfilled in the miracles of Jesus Christ. Through the life of Christ, the human race received a glimpse of the new earth that is to come. It will be a place where the miracles performed by Christ two thousand years ago will be in perpetual abundance. The blind will see. The deaf will hear. The lame will leap like deer, and the mute will shout and sing. The Dead Sea will spring to life, and the name of the Lord alone will be worshiped throughout the world. All idols, false religions, and false prophets will disappear. The new earth will be filled with people who know the Lord and are devoted to Him only. On the new earth, Jerusalem will be the center of the world. It will be the dwelling place of the Lord, and people from every nation will travel to Jerusalem to worship and to have their disputes settled. War will no longer exist. Because of this, armies and weapons will no longer exist. The Lord will settle all disputes, and the people will devote the energy they previously expended on war to prosperous living and worship of the Lord. Peace and prosperity will be abundant, and there will be nothing to fear. Knowing what we now know about the new earth, who would not want to live there? Unfortunately, the bible also tells us that many will turn down their invitation to this blessed new world. The only way to get there will be to place one's trust in the Lord Jesus Christ, who will be the undisputed ruler of the new earth. When Will This Future World Arrive? Because the new earth is the creation of Jesus Christ, it will not arrive until after His Glorious Appearing. In the interim, many politicians, idealists, and others will conjure their own ideas of how to create such a world. But placing faith in any of these people or their schemes will only lead to disappointment. When God dwells among men, the earth will no longer harbor death or sorrow or crying or pain. It will be a new world. The old world will have come to an end - its evils gone forever. The arrival of Jesus Christ at the Glorious Appearing should not be a time of anguish, but a time to rejoice. Although we are familiar with the things of this world, we can not fathom the glory of that which God has in store for us. It will far surpass the things of this world, so we should patiently and eagerly await the Lord's return. For Christ's return will bring with it our salvation and the blessings of the new earth. In short, don't fear the end of this world. Celebrate it. Christ is coming. And when He arrives, He will eliminate all the evils of this world, including our fear and worry.